Aquatica’s Storage Lovers Bathtub is one of our most contemporary styled bathtubs and has been uniquely crafted and designed in Italy. With the use of our exclusive AquateX™ material for the construction of this one-of-a-kind and utterly different bathtub. 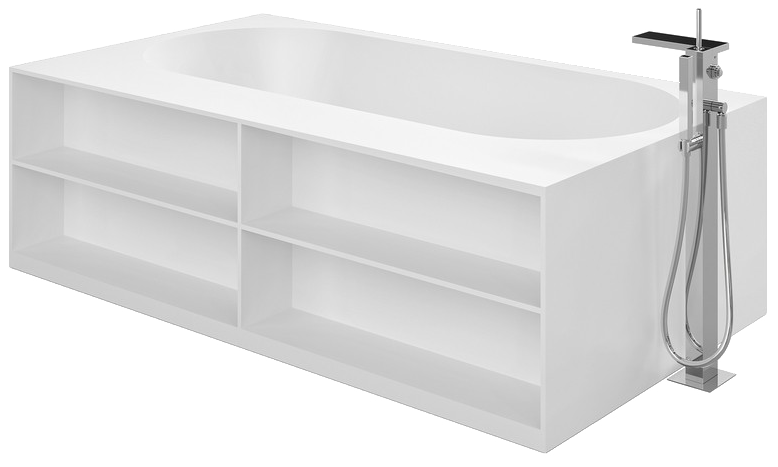 The Storage Lovers Bathtub is available in 4 different installations, freestanding, wall-mounted, corner fitting, and niche/nook installation. With a uniquely built-in book shelf on the longest side of the tub, this tub doesn’t only look fabulous but will give you extra storage room too. 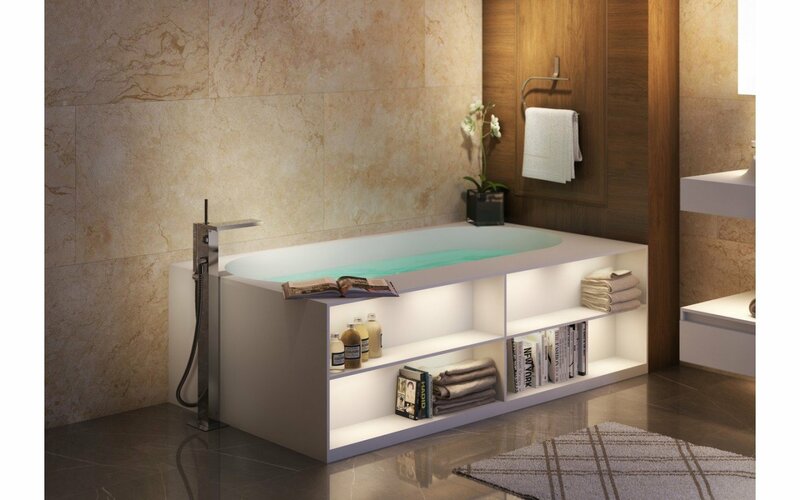 This amazing bathtub has been created and designed with convenience in mind, especially if you love books, knick-knacks, and pretty much any other bathroom storage items! 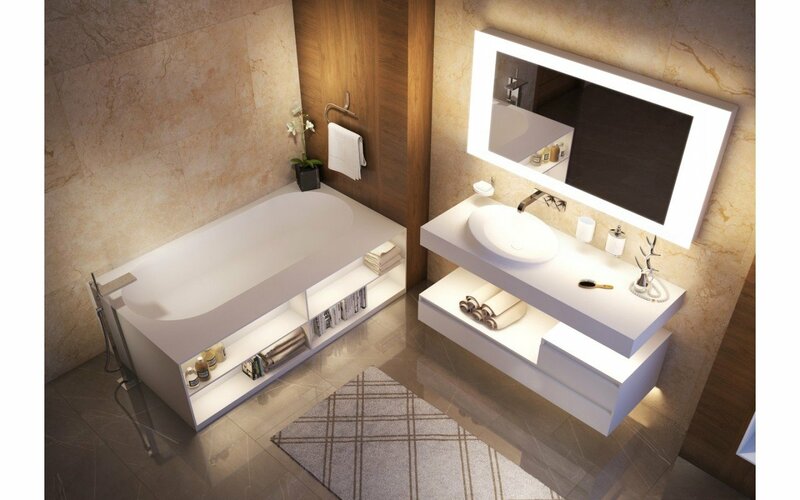 The Storage Lovers Bathtub is can also be bought in a super convenient Bathroom Furniture Set or just on its own. Taking a leaf from its own book, the storage lover’s bath is another of our spacious, generously proportioned tubs that are easy to get into and very hard to leave. The extended length of the interior is ideal for bathing seated – with a good book from the bath-side shelves. Or lie and soak at a full stretch up to your neck in warm water. Room to invite a friend, and start your own bath-time book club! 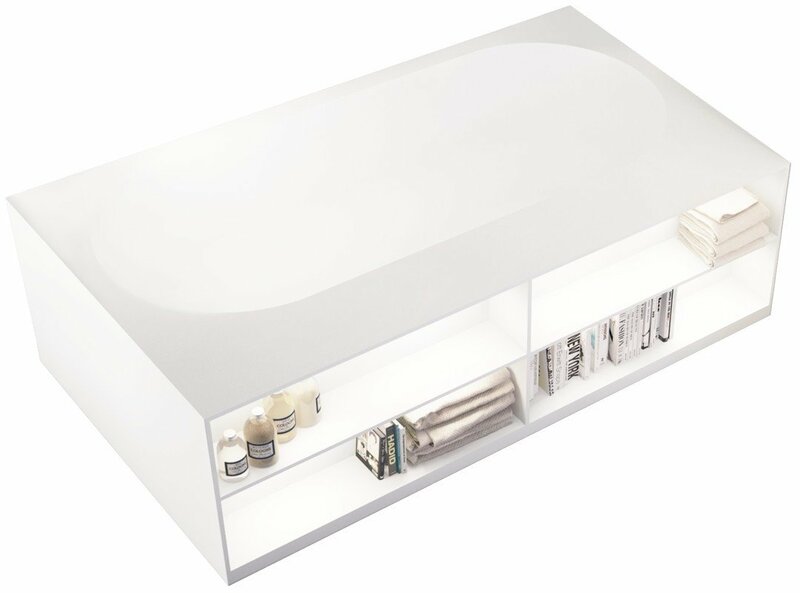 For those who bathe predominantly for pleasure and relaxation, this truly unique Italian design concept cleverly incorporates a set of storage shelves in which to keep all your favorite bathing accouterments with your new bathtub. Thick, fluffy towels, that stunning scented soap, bath foam or sponge; even a small library of your favorite author’s latest works are now all at your fingertips. Convenient storage all for those essential bathroom items is now fully catered for. Whilst a very modern idea in bathing, with contemporary lines and this very smart shelving concept, the storage lover’s bathtub has also been designed with a nod to classic bath style and comfort. The more traditional internal shaping of the bath - a generous oval – reflects this tub’s commitment to luxurious bathing, where time is unimportant, and pampering is key. Not only do the shelves in this bath provide convenient storage. The wide surrounds, spacious corners and broad rim above the shelves allow you plenty of room for that delightfully scented candle, that glass of bubbles, a place to rest your reading material or personal sound speaker. 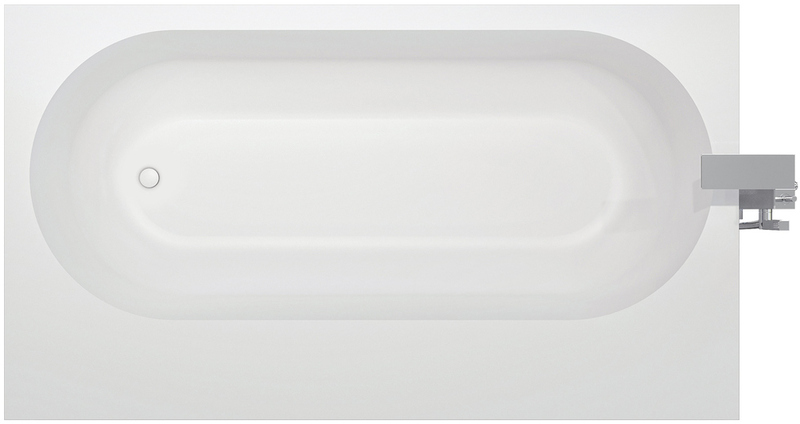 Crafted in smooth, matte-finished AquateX™, this extended length bath has applied ergonomic principles for optimized seated or reclining bathing comfort. 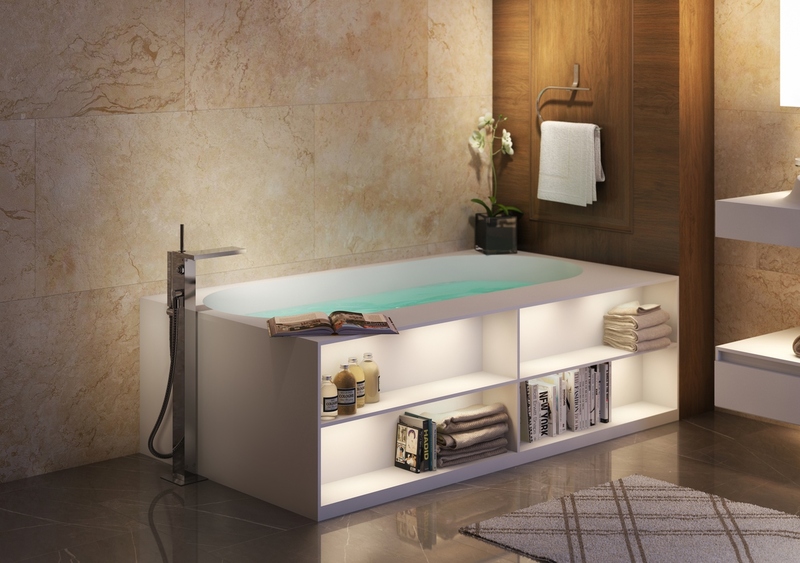 The wide rim allows storage of bathing items whilst also assisting entry and exit of the bath. 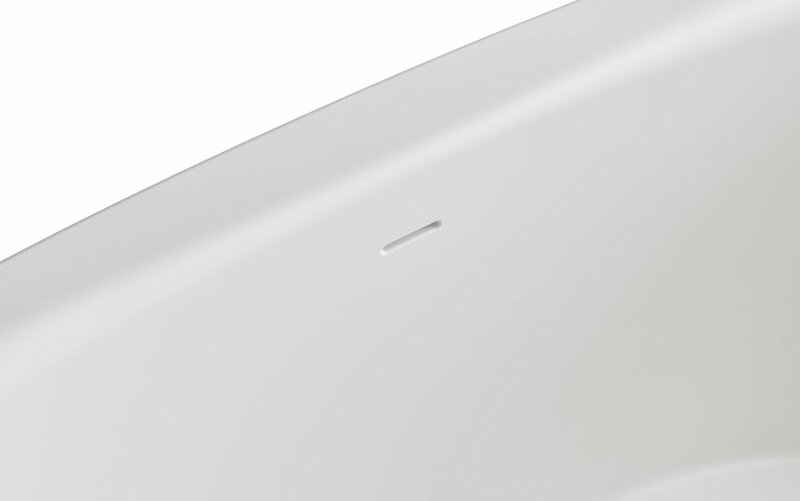 The discreet overflow and matching AquateX™ drain plug preserve the uninterrupted lines of the bath, whilst the novel storage shelves are very handy for everything from towels to your favorite bath-time reading.